McKinney has begun to clean up damage left by Tuesday's storms. Major wind gusts downed tree branches, pulled off loose shingles and caused other property damage. "I'd say 60 to 70 mph at least -- it was really snapping trees left and right down here," Bill Cunningham said. A mature tree near a home owned by his mother-in-law had split, hanging precariously above the property. "It split down the middle, and the wind twisted it a little bit right over a shed, so they had to do something quick before it crashed into the shed," he said. James Watt, owner of DFW Treetrimming, said his phone has been ringing off the hook since Tuesday afternoon with requests for tree removal in McKinney, Dallas, Coppell and other parts of the Metroplex. "There were trees on top of houses, trees were split, about to go through the car," he said. "It just hasn't stopped." 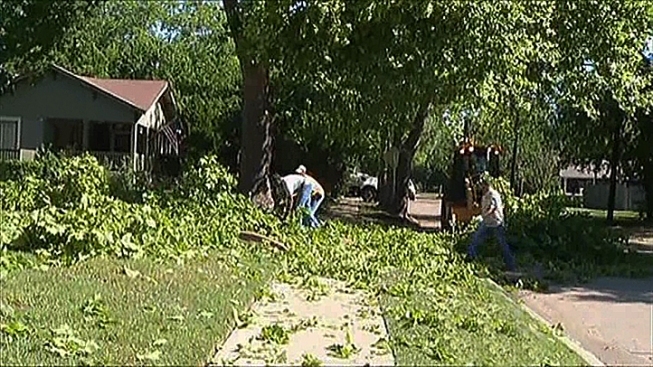 The city of McKinney has also been responding to tree and branch removal calls.